There's a curious comparison to be made with our and what was going during the Truman Administration. Only then it was under the guise of the Red Scare. Now, it's just partisanship, race baiting, fear, innuendo and character assassination because it can be gotten away with. But in 1951 the air was pretty thick with paranoia and the of Washington were shot gunning hate at every opportunity. 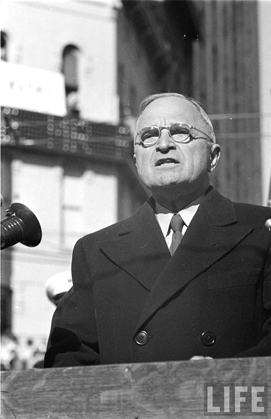 So much so, that President Truman had a few words to say about it at an American Legion building dedication on August 14, 1951. Funny - he could have said that about an hour ago.